Everyone has one, whether it's a Pinterest board filled with images of beautiful places, a mental checklist or a written list, if you love to travel, you've got a running list of places you'd like to visit someday. I know that I had one well before I became a travel consultant, and now that planning trips to all of these amazing destinations is my job, well, let's just say that list hasn't gotten any shorter. I thought I'd share a few of the destinations at the top of my list at the moment ... I'd love to hear where you're dreaming of heading! I am a little bit obsessed with the distinct beauty and unique cultures of the many countries of Africa. Of course I want to spend time seeking out the Big 5, but I also want to see the grandeur of Victoria Falls, and I want to trek through the jungles of Rwanda or Uganda in search of the world's largest primates — gorillas. Plus, I want to see the dramatic sand dunes and meet the beautiful Himba of Namibia. Oh, and of course I want to see the lemurs and baobabs of Madagascar! And spend time lounging on the breathtaking beaches of the Seychelles! Seriously, Africa is a bucket list in and of itself for me. This is one long-term dream destination that I'm knocking off my list this October. Angkor Wat is the largest religious monument in the world and an incredible sight to see, and it has been near the top of my list for quite a while. But Angkor Wat and the other temples of Angkor are not the only reason to head to Cambodia. Unfortunately, I only have a few days to spend in this amazing country, but I'm looking forward to seeing the stilted Khmer village of Kampong Phluk, built within the floodplain of the Tonle Sap; visiting the Phsar Chas (Old Market) of Siem Reap; learning about the country's art and artisans at Artisans Angkor; experiencing delicious Khmer food and nightlife on a Vespa tour; and enjoying an evening at Phare, the Cambodian circus. After my time in Siem Reap, I also made sure to plan some time in Phnom Penh where I'll spend some time at the National Museum, the Genocide Museum and the Killing Fields, where I hope to better understand the country and its troubled past. I'll be the first to admit that I'm not (yet) an expert in the Galapagos Islands, but I have been doing quite a bit of research about this amazing destination, and it has snagged a spot in my top five for a couple of reasons. First, of course, is the diversity of wildlife. Being able to see species of animals that exist nowhere else in the world is a once-in-a-lifetime opportunity that I definitely want to experience. Second is the beauty of the land itself, which is sometimes overshadowed by the animals that inhabit it. These volcanic islands harbor some incredible hiking and breathtaking vistas. For example, did you know that Isabela, the largest island, is home to Sierra Negra, the world's second largest caldera? Hiking this active volcano (one of five on Isabela) is definitely on my list! OK, yes, this one is very specific and I'm not going to go all the way to India just to see the Taj Mahal, but I think the building can stand alone on my list for now. It is, of course, one of the most famous monuments in the world AND one of the New Seven Wonders of the World that I haven't yet visited, so there's a good enough reason for me to want to take a gander. Plus, the architecture and history are fascinating, and it's a monument to LOVE, and we could all use a little more love in our lives, am I right? I'll admit that it was Rick Steves who turned me on to the beauty and splendor that is Croatia. When I saw an episode of his show featuring his travels in Croatia, I remember Googling the country immediately and babbling on to my husband about how we HAD to visit. This was many years ago, before Croatia was a hotspot for travelers looking for a different sort of European seaside vacation. 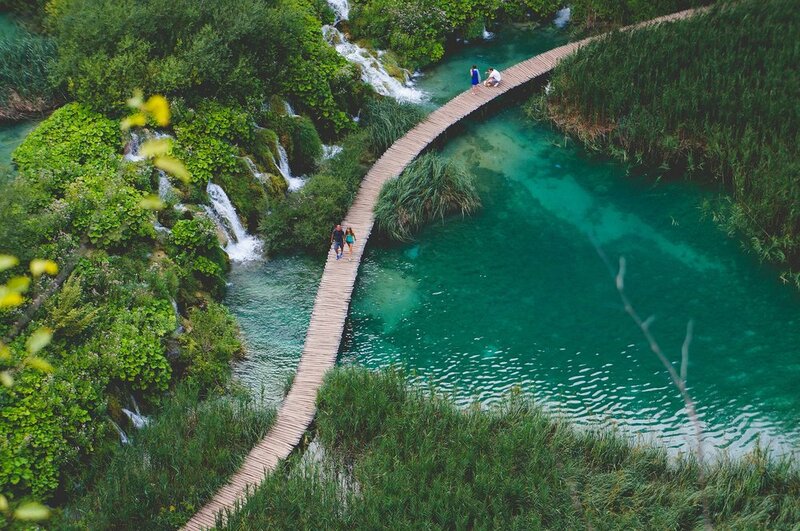 The hook for me is really Plitvice Lakes National Park, which is a wonderland of terraced blue lakes joined by waterfalls and crisscrossed by boardwalks. It's something out of a fairytale, and while I know there are significant crowds to contend with these days, it's perhaps the destination I'm most excited about within Croatia. There is also incredible history, hilltop castles and fortified cities, island hopping, kayaking, hiking, and caving ... even Game of Thrones connections to explore! So where do you want to head next? Those are my Top 5 dream destinations ... for the moment. Are any of them on your list as well? Just a quick note that one of my specialties is custom-designing these once-in-a-lifetime journeys so that you can finally visit the places you've wanted to see your whole life. If you want to stop dreaming about these destinations and start planning your trip, let's chat! You can set up a time for a complimentary planning session with me or you can share all of your travel dreams through our travel interest form. I'd love to help make your next trip amazing!